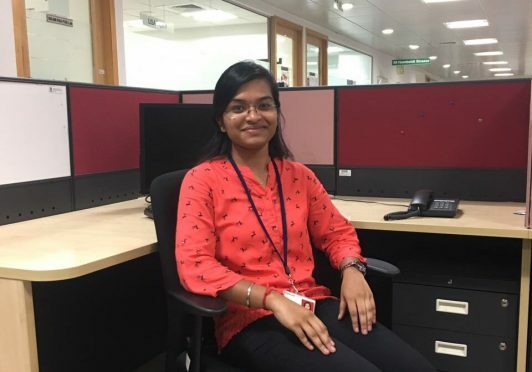 About the Author: Nithyashree S from RV College of Engineering shares insights into her internship at Siemens and how it provided her an opportunity to start off her career. I was on the lookout for an internship to explore my capabilities and gain knowledge to shape my future when I received an email from the college placement cell regarding the Siemens Student Program which was a 14-month internship offered to the 2nd year students. With just one day left for the company’s visit, I did a background check on the company and recapitulated my conceptual knowledge. I attended my first pre-placement talk attentively to understand how the company functioned and the technologies they endorsed. Then, there was an online test comprising of numerical analysis, verbal and logical reasoning. Every question had a timer, so we had to be quick as well as accurate. After clearing the test, I went for the interview ready to bedazzle the interviewer with my wit and skills, unlike other candidates who were anxious. After taking a glance at my resume, the interviewer asked me to introduce myself. I talked about my areas of interest and expertise and mentioned my technical skills. This was an opportunity to amaze him and leave an indelible impression on him, and I did just that. I was asked some basic questions about microprocessors and microcontrollers. He tried to confuse me, but I remained rigid on my answers and convinced him. He asked me to write a program in 8086 assembly language. He wanted to get a view of my approach to do so and my ability to explain it to him, and I impressed him with my logic. Then, we had a casual interaction about his journey at Siemens and my enthusiasm for electronics. He suggested me to be flexible to work outside my comfort zone. I had established a good rapport with him. After getting through the technical interview, I appeared for the HR interview wherein I was asked about my family and educational backgrounds. I exhibited enthusiasm to work for the company. Two interviews later, I had realized that the interviewers look for problem-solving skills, ability to learn new things, and communication skills in an applicant. My technical interview went on for about an hour. And as I came out, I was told that I had cleared it and that I had to give my HR interview. In the HR round, general questions about family background and resume based questions were asked. It is necessary to exhibit great interest and enthusiasm to work for the company. Often it will be a test of common sense and attitude. My confidence blended with humility had done its magic, and I had made it to Siemens along with 11 of my batchmates. I entered the premises of the organisation unwary of what awaited on the other side of this journey. I was undergoing a complete shift – from the frenzy of college to corporate ethics. There we addressed each other by our names. After carrying out the formalities, all the interns were split into teams of four and a mentor was assigned to each team. I was assigned to the Energy Management Division, the initial excitement of working in the field of energy and electronics ceased when I was informed that I had to work in software development. I didn’t want to get into software and shared my concern with my manager asking her to assign me an electronics project. She convinced me to give it a try. I was in a state of ambivalence, but I managed to try my hand at my first software development project. Our team had interns from both computer science and electronics backgrounds, so we effectively divided the work among ourselves. I had a notion that corporate staff was self-centric which no longer held true. At Siemens, we believed in ‘Together we deliver’. I moved away from my comfort zone and started learning to code. It was not easy to move from circuits and transistors to codes but it was fun. I developed a taste for something I had initially despised. We developed a software tool for test automation. Although we were pretty confident about our software, the testing team disagreed. The application crashed while it was being tested leaving us in a state of flux. This taught me that the job doesn’t end with the desired output; it is important to develop products which meet the high scalability of the industry. The tool was received well by the concerned stakeholders after we had fixed the glitches. I was given many challenging tasks there but I learned, worked on them, and delivered them successfully. I developed an ability to learn quickly and perform better each day. I learned to multitask and manage my time effectively. I interacted with a lot of people and widened my perspectives. This was a year-long internship. After my 2nd year summer break, I came back to college and continued working on some office assignments. I found it a little difficult to adjust to the college environment after spending the summer at an established organisation. I was a new person then and my friends and teachers complimented me on the transformation I had gone through. The people around us play a very important role in our growth. They make us realise that we haven’t made the best use of our time which gears us to push ourselves beyond our boundaries and embrace success. This is where making a right choice about the internship becomes crucial. While some internships can have a significant impact, some could turn out to be unproductive and trivial. An effective survey about the company before taking up the internship is highly recommended. That way ‘Internshala’ has helped many of my friends in finding the right internship and make the best out of it! I felt inferior on seeing extremely talented people around me, but I pushed myself beyond my boundaries and discovered my true potential. After coming back, I worked with an NGO for youth empowerment, took part in a national level hackathon, and published a couple of papers. Siemens gave me an opportunity to kick-start my career and a lot of cherishable memories and taught me a million lessons. Do you also want to try your hand at coding? Apply to these cool programming internships and code your career. The best thing the gift the site gta 5 money for the good learn this page. I Liked Your Website Its Very Helpful To Me.